The New Pearl Buttons perform American music of the mid to late 19th century (circa 1845-1900). The ensemble includes mandolin, singers, flute and piano and often plays historic sites in Wisconsin and Minnesota, including the Historic LeDuc Estate in Hastings, MN and several festivals. Recently the band has teamed up with author-illustrator team Dave Geister and Pat Bauer to present educational readings and programs to audiences of all ages, based on their new book B Is For Battle Cry: A Civil War Alphabet. The “Pearl Buttons” perform with Don and Sherry Ladig (flute, vocals and piano) as a duo, or as a trio with the addition of John Wenstrom on mandolin and vocals. The group is available in 1860’s costume for all festivals and celebrations. 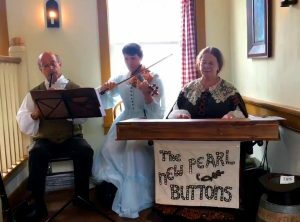 The New Pearl Buttons (Don, Sherry and Rosa edition) play mid 19th century European and American cafe music for your dining pleasure from 1-2:30 p.m. Sunday April 14 at Waldmann's Brewery and Wurstery, an authentic 1857 saloon in Saint Paul. The food is great and the atmosphere is delightful. Yummy food and beers are crafted on the premises. Come for the music; stay for the poetry! The New Pearl Buttons (mandolin/vocal edition) play from 6-7 pm and local poets Michael Moos and Thomas R Smith read from their new collections from 7-8 p.m. The New Pearl Buttons offer up Irish tunes, mid 19th c. American quicksteps and songs, and even a little Willie Murphy repertoire! Food and libations here are excellent. Come on down! Come on down for the first Sunday in May for New Pearl Buttons (mandolin/vocal edition) . We're playing 19th century American tunes and songs, as well as Irish jigs and quicksteps! The food is homemade and yummy; the beers (and nonalcoholic offerings) are refreshing and the authentic 1857 atmosphere can't be beat. We're there 1-2;30 p.m. for Sunday brunch time.